AX2012 R3 CU8 introduced exciting new cross-docking functionality for product packages. This article describes the setups that must be in place for cross-docking to work in the warehouse. The 2nd part of the post describes the end-to-end process from the creation of the purchase order through to the shipping of the transfer orders. Product packages are defined combinations of products/variants which are purchased from one vendor. They are set up under Retail > Setup > Replenishment > Product package. Two product packages exist in the R3 demo data. They are each purchased from vendor 1001, and they each contain different quantities of two different styles of product T-0010. We will use one of these packages in the example in the 2nd part of the post. A location in the warehouse must be defined as the cross-docking area. The location X-DOCK has been setup as the cross-docking area in the demo data. This location has a location profile X-DOCK, where ‘Use license plate tracking’ and ‘Allow mixed items’ are enabled. Location directives are used to direct where goods will be put or picked from. Two location directives are used for cross-docking. The first, which will be used when goods are received, has a Work order type of Purchase order. 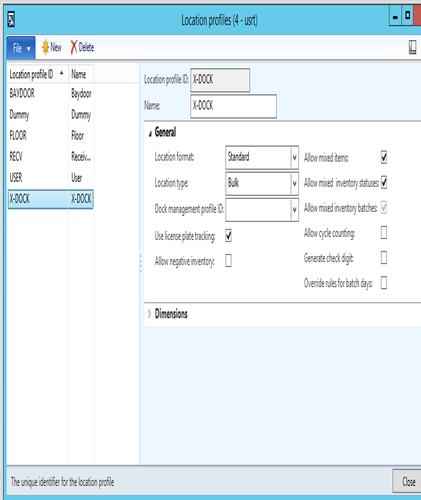 The PO X-DOCK PUT is the location directive which will direct where incoming items for cross-docking are put. The query behind the directive identifies the receipts to which the directive should be applied i.e. the purchase order lines which have been marked for cross-docking. 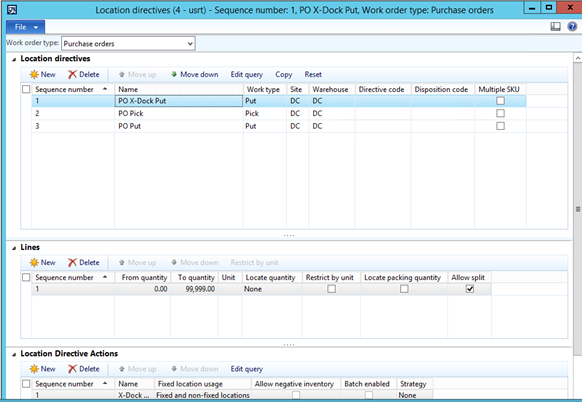 These purchase lines can be identified by the Cross-docking field in the WHSPurchLineTable (Purchase order additional fields). 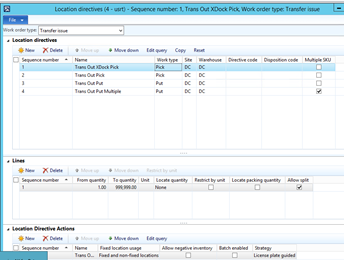 The location directive for issues TransOutXDockPick has a Work order type of Transfer issue. The goods should be picked from the X-DOCK location. Note that the Strategy is LP Guided. 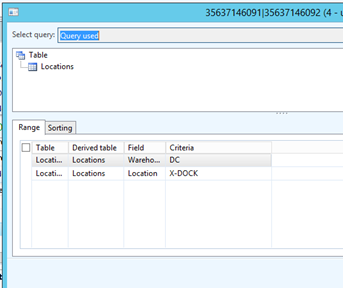 Again the directive query identifies the transfer orders for which this directive applies. 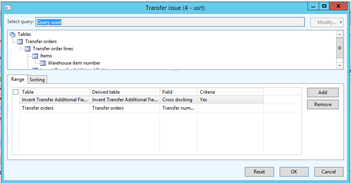 The transfer order lines which have been marked for cross-docking can be identified by the Cross-docking field in the WHSInventTransferLine(InventTransferAdditionalFields) table. 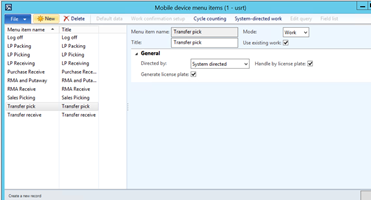 Two mobile device menu items are required for receiving – License plate receiving and LP Packing (Pack to nested license plates). The ‘Transfer pick’ menu item is required for the outbound process. Note that ‘Handle by license plate’ must be enabled (This is not enabled in the demo data). In the 2nd part of the post, the end-to-end process is described.